Join the Boulder community for this year’s 17th annual Whittier-Mapleton Garden Tour. 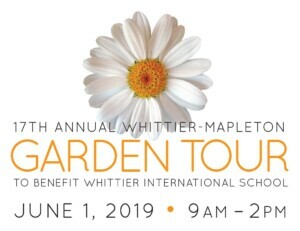 This self-guided walking tour showcases beautiful, private gardens throughout the historic Mapleton Hill neighborhood and benefits the Whittier International School. The Mapleton Hill neighborhood was designated a historic district in 1982 and remains Boulder’s largest historic district today. Almost 100 years prior to its designation, developers planted over 200 Silver Maple and Cottonwood trees throughout the Mapleton area. Many of these trees still stand today, creating picturesque, shady streets lined with charming homes. This event allows our community to tour otherwise private estate gardens. From brightly colored flowerbeds to modern, water sculptures to expertly sculpted hedges – each garden is sure to delight and inspire with its originality. After the tour, be sure to swing by “The Hive” at the corner of Mapleton and 8th and grab a bite to eat at one of the delicious food trucks. The longest operating school in Colorado, Whittier International School educates students from over 20 countries speaking 17 different languages. This historic landmark endeavors to provide learning opportunities based upon critical thinking and inquiry. Whittier represents our diverse community, promoting tolerance and kindness throughout the Boulder area. Proceeds will benefit a variety of Whittier’s programs, including school lunches, classroom supplies, and more. The Whittier Garden Tour will take place on June 1 from 9am – 2pm. Tickets, maps, and swag bags can be picked up at The Hive located at 840 Mapleton. You can purchase tickets online or buy them on the day of the event. Normally, around 60 homes participate. The gardens are intricate and inspiring, so many guests end up touring seven or eight during the event. Held on the same day as the Mapleton Hill Rummage Sale, these events make for a complete weekend outing in one of Boulder’s coolest neighborhoods. Stroll through remarkable gardens and stumble upon eccentric finds at one of the 60 homes participating in this annual event. To see a preview of what to expect from 2019’s garden tour – check out last year’s videos here. The Whittier Garden Tour is a time-honored tradition in our vibrant mountain town. It’s the perfect way to celebrate spring, meet the community, and see the historic Mapleton Hill district in all of her glory.